I had been working with Mr. Wallace for quite some time – almost a year! – when this beautiful house came along. 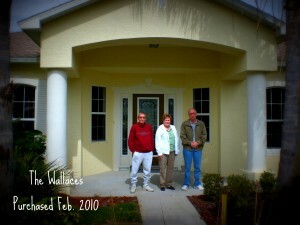 Mr. Wallace lived in the area and knew that his brother and sister-in-law wanted to find a seasonal home in Port St Lucie. As soon as the sign went up in the front yard Mr. Wallace called me to check the MLS and find out the details. It was a 4 bedroom Holiday Builders model home for a great price! Not needing to think too long, Mr. Wallace and his relatives made their offer. The bonus came along when the builder announced they’d be happy to sell the furnishings in the home. Just imagine getting all the furniture in a decorated model home (professionally decorated, nonetheless) for under $5000! I was sure jealous! To top things off, Mr. Wallace decided to buy the lot next door as well. The happy ending is that the transaction closed smoothly and now when the Wallaces come to visit Port St Lucie, they don’t have to worry about buying furniture – they just need their clothes and their toothbrush!